Like most other liberal arts programs in the Faculty, the HESO program is not vocationally based,. 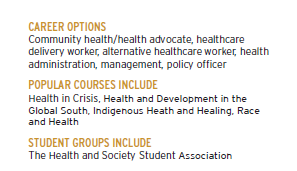 It focuses on a broad interdisciplinary approach to health, which provides a background for students seeking employment in the health care sector with both non-profit and private agencies, health organizations, and government at all levels, as well as providing a health background for students who wish to focus on health in fields such as law, journalism, women's issues and social activism. Students who wish to pursue graduate training in the health care field will find that it provides an excellent foundation for health professions, such as occupational therapy, various counselling professions, such as social work, and studies in community health, as well as graduate studies in Health, Public Health, Global Health, Disability Studies, Environmental Studies, Social Justice Studies and Health Administration. Clinical Researchers function as administrators, coordinators, consultants, educators, and/or researchers in the management of clinical trials. They oversee the administration and progress of a clinical trial while understanding the ethical and legal ramifications for all participants, including protocol development, data collection, analysis, monitoring, recording, auditing, ethics and regulations, liabilities and responsibilities of conducting research with human subjects. Clinical Researcher possess a knowledge of the Canadian health care system, health care legislation, procedures and practices for regulating the development of health care products. They formulate a clinical development plan, ensure clinical trial data is credible and accurate and that the rights, integrity and confidentiality of trial subjects are protected. Clinical Trial researchers are professionals from a variety of academic backgrounds, including health sciences, medicine, nursing, health informatics, or epidemiology. The Environmental Technology field is an emerging profession with a wide range of possibilities for employment in many different industries, mining, construction, waste management, manufacturing as well as any other industry with the potential to create pollution. Environmental technologists aim to clean-up pollution or help others to cause as little pollution as possible. Environmental Technologists may do any of the following: oversee wildlife/vegetation studies, creating educational programs for communities, manage environmental clean-up projects, take samples of soil, water and air, create and review technical documents, conduct mould investigations on houses and other buildings, collect data by means of catch and release fishing on a lake. Often employed by federal or provincial departments, they would develop expertise in at least one specific area of health policy expertise and to put forward ideas for program strategies and reports in that specific area. Within his/her area(s) of expertise, the Policy Analyst is expected to follow developments and emerging issues at both the state and federal levels. A key responsibility of the Policy Analyst is to conceptualize, research, and write reports (short and long formats) and, when needed, work with outside consultants to generate unique data analysis for reports. Medical anthropology is a broad, interdisciplinary field, encompassing scholars who study a variety of topics relating to health, illness, and healing from sociocultural, biocultural, clinically applied, and other related perspectives. While some medical anthropologists are trained primarily in anthropology, others have studied anthropology after training and working in health or related professions. Medical anthropologists conduct research in settings as diverse as rural villages and urban hospitals and clinics. They may teach medical anthropology in university anthropology departments, medical and nursing schools and in community-based settings. Their studies may look at the development of systems of medical knowledge and health care, patient-practitioner relationships, the integration of alternative medical systems in culturally diverse settings, the interactions between biological, environmental and social factors influencing health and illness at both individual and community levels, and the impacts of biomedicine and biomedical technologies in non-Western settings. Historians produce written records of past events through primary and secondary research and by applying an analytical assessment of that material. Medical historians focus on issues pertaining to health and medicine, including, but not limited to the history or medical and scientific knowledge and discoveries, chronic and infectious diseases, understandings of how the human body functions, reproduction, the social construction of disease, etc. Medical Sociology is comprised of social and behavioral scientists who are interested in the social contexts of health, illness, and health care. Topics of interest include the subjective experience of health and illness; political, economic, and environmental circumstances that threaten health; and societal forces that impact on the medical care system and on people's responses to illness. Medical Sociologists are concerned with basic sociological research and its implications for public policy and practice. Medical sociologists work in a large variety of settings: academic teaching, academic research, government planning and regulatory agencies, government research, hospital and health institution policy and research, and citizen advocacy. The increase in the number of seniors has created a growing demand for workers with knowledge and skills specific to the needs of later life. Today, many elderly choose to participate in the community and rely on age appropriate activities to remain vital. The primary goal of the activation co-coordinator is to design and deliver meaningful activity programs that enhance the quality of life of older persons. Activation professionals find employment in a variety of settings such as community centers, day centers, retirement and/or nursing home facilities. This profession offers the opportunity to work with a wide range of people and positively affect the aged community. An assaulted women's and children's counselor works with women and children who have experienced or are experiencing violence. They advocate for these individuals and counsel them throughout challenging times. They are often agents for change through their work in community education, political action and law reform. Assaulted women's and children's counselors often take a supportive as well as professional role in working with their clients. Employment opportunities can be found in women's shelters, community centers, and government. Career and work counselors advise people on career planning, career change, career reversion, and school to work transition, sometimes related to injury, illness, inappropriate career choice or job loss. They are prepared to deliver career counseling services that are professional, informed and current. Job-searching techniques, job-search preparation, career management, and resume writing assistance are also part of this position. Counseling settings are generally one on one but group counseling may also be required. Employment settings include career counselors, worker rehabilitation assistants, corporate career planners, job search facilitators, and information service providers. Child and Youth workers work with distressed children, adolescents and their families in settings such as the Children's Aid Society, open custody group homes for young offenders, residential and day treatment programs in children's mental centers, schools and psychiatric hospitals. They work with teachers, social workers, psychologists or psychiatrists as part of a clinical team. Children and Youth Workers responsibilities can include implementing the treatment plan developed by the team for children or adolescents suffering from withdrawal, depression, violence, legal troubles, or family conflicts. Employment opportunities can be found in residential programs, day treatment programs, schools or private family work. Developmental Service workers promote the development and maintenance of health and well being, life skills, and personal empowerment of people with developmental disabilities. They also advocate the development of inclusive communities that accept people with disabilities as valued and participating citizens. As a Developmental Services worker, you will support people of all ages with different linguistic, cultural and ethnic backgrounds and their families, in a wide range of community settings. Career opportunities include working in homes (with families, in group homes or in independent living arrangements) schools (elementary and secondary), employment (sheltered and competitive) and recreation/day programs (for adults, children and seniors). Disability Studies teaches students how to support individuals and families affected by disabling conditions and chronic health concerns. Students learn how to support individuals who are learning how to live, learn, work, and participate in their communities. Disabilities studies prepare students to take leadership roles in community-based agencies or advocacy roles in the disability movement. Social Service workers offer valuable support and information to diverse communities. They develop the abilities to respond to individual and community issues of homelessness, poverty, substance abuse, mental health concerns, oppression, crisis and other determinants of health and areas of social justice. Family work, group facilitation, program planning, community resource management, service delivery co-ordination and advocacy all fall under the scope of work. Employment opportunities can be found in a number of agencies including addiction and mental health services, residential group homes, day treatment programs, case management services, shelters, drop-in and community centers, family service organizations, hospitals, governmental and non-governmental services. In addition there is opportunity for international placements. The Social Service Worker with concentration in gerontology integrates the knowledge base, professional values, and skill sets of social service work, with specific concentrations on the needs, challenges, and concerns of the elderly population. They have the ability to co-ordinate home services for the aged (e.g. meals on wheels, transportation, friendly visiting, congregate dining, homemaker service and telephone reassurance); work in Alzheimer programs; activation co-ordination; supportive housing co-ordination, and co-ordination of volunteer programs. Employment can be found in government agencies, not-for-profit agencies, for-profit agencies, retirement homes, and through private individuals. Health and wellness in the corporate setting is an emerging and exciting field in the health management sector. Many large corporations are identifying that a health and happy work population is also a productive population. To that end Health and Wellness consultants emphasize a holistic approach to achieving workplace, community and personal wellness and promote a mutli-disciplinary approach to well being. They assess health risk factors, design implement and evaluate strategies and programs, manage programs and personnel in accordance with organizational policies and procedures and implement lifestyle coaching. Employment opportunities can be found in the corporate sector, not-for-profit institutions, universities, hospitals and international locations. Chiropractors practice a drug-free, manual approach to health care that includes patient assessment, diagnosis and treatment. In particular, chiropractors assess patients for disorders related to spine, pelvis, extremity joints, and their effect on the nervous system. Chiropractors are also trained to recommend therapeutic exercise and other non-invasive therapies. The vast majority of patients who seek chiropractic health care do so for complaints of the musculoskeletal system, most often for conditions affecting the spine such as back pain, neck pain and headaches. Chiropractors are often sought out for therapeutic adjustments and are employed in rehabilitation clinics, medical facilities, and in private practice. The demand for qualified exercise specialists to provide client-centered, individual or small group exercise/activity sessions has increased over the last decade. Fitness and Lifestyle Managers meet the multidimensional demands of a dynamic market for fitness and preventative health care as well as the growing areas of exercise rehabilitation and personal training. Employment opportunities can be found in a variety of commercial fitness facilities, community centers, recreation centers, employee fitness centers, home gyms, hospitals and rehabilitation clinics, as exercise therapists, fitness programmers, hotel and condominium facility managers and personal trainers. In addition Fitness and Lifestyle Managers can take advantage of the newest trends in preventative health care management and branch out into their own businesses. As people become more aware of healthy lifestyles and wellness, there is a growing need for specialists in holistic and complementary therapies. Holistic therapies draw from a variety of models, both traditional and alternative, and focus on the connection between mind, body and spirit. They assist in maintaining and embracing optimum health and well being. Holistic therapies are complimentary to chronic pain management, palliative care including AIDS, stress management, fibromyalgia management and arthritis management. Employment opportunities in the area of holistic health include private practice, working in natural therapy clinics, or integrated medical facilities. Homeopathy is a 200-year old system of medicine that uses various plants, minerals or animal products in very small doses to stimulate the body's natural ability to heal. Homeopathic remedies prescribed act deeply and curatively to stimulate the body's own defenses rather than suppressing symptoms. Homeopaths treat the whole person not just the symptoms and can improve health on all levels of body and mind. Homeopaths are employed in alternative care clinics, health and healing facilities or set up private practice. Massage Therapy is a recognized professional health care discipline which allows you to work directly with a wide range of people to relieve discomfort and pain. Currently, there is a growing demand for the services of Registered Massage Therapists. The practice of massage therapy includes the assessment of the soft tissue and joints of the body and the treatment and prevention of the physical dysfunction and pain in these areas. Registered Massage Therapists can find full or part-time employment in fitness clubs, health clinics, sports rehabilitation centers aesthetic spas, as well as professional and amateur sports teams. In addition, massage therapy offers a great opportunity for self-employment. Midwifery is more than delivering babies. Midwives provide high quality cost-effective care to childbearing women from early in pregnancy to the postpartum period. They counsel, monitor and support the health of the mother and newborn providing primary care for births in hospitals and women's homes. Their expertise in the care of normal pregnancy and childbirth is based on an understanding of childbirth as a social, cultural and biological process in addition to midwives' ability to competently exercise clinical and decision-making skills. Many Midwifes choose to work out of private practice but can also opt to be part of women's wellness centers or alternative clinics. Naturopathic medicine is a complete and co-coordinated approach to health care. It is the art and science of disease diagnosis, treatment, and prevention using natural therapies and techniques. Doctors of Naturopathic Medicine are specialists in natural medicine and preventative health care integrating scientific knowledge with traditional healing wisdom. They are health-care professionals who use safe, gentle, non-invasive therapies including clinical nutrition, botanical medicine, etc. to assist the whole person in maximizing the body's inherent self-healing capacity. Naturopaths work in health and healing clinics, in multidisciplinary care facilities and in private practice. Dieticians and Nutritionists are specialists in food and nutrition. They generally work as members of a health care team to promote and support the health of individuals and communities. Scientific aptitude, organizational ability and management skills are required in this profession in order to plan, administer and supervise programs. Dieticians and Nutritionists need to be able to work well with people and be good communicators. Flexibility and adaptability are important. Marketing, counseling and research skills are becoming more important. Areas of specialty in the diet/nutrition area include: clinical, community, administration, and research. Employers of dieticians and nutritionists include hospitals, community care facilities, public health and educational institutions. In private practice these professionals work with private clients, the advertising industry, the food industry, and as consultants to provide consumer education. Expressive Arts Therapy recognizes the healing power of the creative and expressive arts. By infusing art processes (movement, music, and drawing) into counseling sessions, the expressive arts therapist helps the client to articulate their feelings. The art work can help build understanding between the therapist and client by serving as a bridge between the inner life of images and sensations and the world of words. Such therapy can help families by providing a powerful tool for deepening communication between couples, and in families. Emergency services communications centers are the public's link to emergency services in times of distress and crisis. The appropriate emergency response begins with the emergency services communicator. They are often the first persons involved with an emergency or incident. The decisions made and the actions taken by them have direct impact on the speed, effectiveness and safety of the response. Employment opportunities include emergency communications operators or dispatchers, 911 call center operator, private police operator, alarm response monitor, Emergency Medical Services dispatcher. The increase in the number of seniors has created a growing demand for workers with knowledge and skills specific to the needs of later life. Today, many elderly choose to participate in the community and rely on age appropriate activities to remain vital. The primary goal of the activation co-coordinator is to design and deliver meaningful activity programs that enhance the quality of life of older persons. Activation professionals find employment in a variety of settings such as community centers, day centers, retirement and/or nursing home facilities. This profession offers the opportunity to work with a wide range of people and positively affect the aged community. Sports Injury/Athletic Therapists apply the knowledge and skills related to massage therapy in an athletic rehabilitative setting. Sports Injury/Athletic therapist treat and assess soft tissue dysfunction in both a clinical and sporting environment in order to enhance the fitness and performance of participants. They utilize manual therapy techniques, therapeutic modalities, rehabilitative exercises and supportive taping and bracing to prevent, recognize, manage and rehabilitate injuries related to sport, exercise or recreational activity. Career opportunities for Sport Injury/ Athletic Therapists include working in physical therapy clinics, chiropractic clinics, sports teams, rehabilitation centers, fitness institutes and physicians' offices. Behavioral Therapists work in a variety of settings with diverse clinical populations of all ages who frequently present challenging behaviors. They may work to develop and implement behavioral interventions designed to manage challenging behaviors and/or teach a variety of skills. Behavioral Therapy is challenging yet rewarding work which can lead to specialization in various areas including autism. Behavioral Therapists find employment in schools, hospitals, residential and treatment facilities and rehabilitation and vocational agencies. Child and Youth workers work with distressed children, adolescents and their families in settings such as the Children's Aid Society, open custody group homes for young offenders, residential and day treatment programs in children's mental centers, schools and psychiatric hospitals. They work with teachers, social workers, psychologists or psychiatrists as part of a clinical team. Children and Youth Workers responsibilities can include implementing the treatment plan developed by the team for children or adolescents suffering from withdrawal, depression, violence, legal troubles, or family conflicts. Employment opportunities can be found in residential programs, day treatment programs, schools or private family work. Developmental Service workers promote the development and maintenance of health and well being, life skills, and personal empowerment of people with developmental disabilities. They also advocate the development of inclusive communities that accept people with disabilities as valued and participating citizens. As a Developmental Services worker, you will support people of all ages with different linguistic, cultural and ethnic backgrounds and their families, in a wide range of community settings. Career opportunities include working in homes (with families, in group homes or in independent living arrangements) schools (elementary and secondary), employment (sheltered and competitive) and recreation/day programs (for adults, children and seniors). Sales in the area of pharmaceuticals and health care supplies are rising each year. Consequently, there is a growing demand for individuals who understand the health care market as well as the current health trends. Those who are social, outgoing and enjoy sales will find this area of work rewarding and enjoyable. Typical job titles in this field include account manager, sales representative, product manager, market planner. Employers include pharmaceutical companies, medical device companies, biotechnology companies, nutritional product companies, and advertising and promotion companies. Mental Health and Addiction counselors are schooled in the various perspectives describing and understanding mental health, mental health disorders and addictions. They assess individuals who require help in this area and based on these evaluations, treat them with self help strategies, support networks or group therapy. Mental Health and Addiction counselors will often work as part of a coordinated team in an effort to aid a particular group or individual. They can and do become valued support personnel in the treatment of persons inflicted with mental health and addiction issues as well as acting as liaison officers with family members. Employment opportunities in this specialty include group homes, government sponsored programs, hospitals, and private clinics. Midwifery is more than delivering babies. Midwives provide high quality cost-effective care to childbearing women from early in pregnancy to the postpartum period. They counsel, monitor and support the health of the mother and newborn providing primary care for births in hospitals and women's homes. Their expertise in the care of normal pregnancy and childbirth is based on an understanding of childbirth as a social, cultural and biological process in addition to midwives' ability to competently exercise clinical and decision-making skills. Many Midwifes choose to work out of private practice but can also opt to be part of women's wellness centers or alternative clinics. Dieticians and Nutritionists are specialists in food and nutrition. They generally work as members of a health care team to promote and support the health of individuals and communities. Scientific aptitude, organizational ability and management skills are required in this profession in order to plan, administer and supervise programs. Dieticians and Nutritionists need to be able to work well with people and be good communicators. Flexibility and adaptability are important. Marketing, counseling and research skills are becoming more important. Areas of specialty in the diet/nutrition area include: clinical, community, administration, and research. Employers of dieticians and nutritionists include hospitals, community care facilities, public health and educational institutions. In private practice these professionals work with private clients, the advertising industry, the food industry, and as consultants to provide consumer education. There exists a wide variety of careers related to occupational health and safety including, toxicology, biology, industrial hygiene, chemistry, ergonomics, information management, computer systems analysis, marketing, sales, and human resources. The mandate of an occupational health and safety specialist is to promote health and safety in the workplace, and promote attitudes and methods which will lead to improved physical and mental health of working people. Occupational Health and Safety specialists work closely with management and administrators, as well as employee committees, to ensure that the correct practices are instituted to protect all employees. Career opportunities can be found in federal, provincial and municipal government agencies, private businesses, large corporations and not-for-profit agencies. Paramedics are on the front line of the Emergency Medical Services. They are the highest level of pre-hospital providers and are often the first medical people at the scene of an accident or sudden illness. Paramedics give immediate care to heart attack victims, car crash victims, and gunshot victims. They even assist in childbirth. Once assessed at the scene by a Paramedic the sick and injured are transported to health care facilities for further treatment. On arrival it is the Paramedics job to brief nursing staff and report their observations and treatment to the attending physician. Paramedics are trained in the use of complex medical equipment; EKG's, and are capable of administering drugs both orally and intravenously. Employment opportunities for Paramedics include: ambulance/emergency services, provincial/international air ambulance services, patient transfer, sports/recreational facilities and industrial first aid departments. A physician is a health care-professional licensed to practice as one of the following: doctor of medicine, clinical psychologist, research psychoanalysts, dentist, clinical social worker, optometrist, chiropractor, podiatrist, or audiologist. LPNs (licensed practical nurses) care for the sick, injured, convalescent, and disabled under the direction of physicians and registered nurses. They provide bedside care, including taking vital signs such as temperature, blood pressure, pulse, and respiration. They also monitor catheters, give alcohol rubs and massages. LPNs monitor patients and report adverse reactions to medications or treatments. They collect samples, feed patients, record food and fluid intake and output. In addition they help with a patient's comfort level by assisting in bathing, dressing and personal hygiene. Employment opportunities include acute care and chronic care hospitals, long term facilities, community health agencies, rehabilitation facilities, and private care. Managers of businesses, government programs and non-profit organizations recognize that effective public relations programs are vital to their success. The core of public relations is building and maintaining positive relationships with an organization's key audiences through two-way communication. Public relations professionals play a vital role in communicating an organization's mission and success. Career opportunities can be found in public relations agencies, corporations, non-profit organizations, and government departments. A Recreation and Leisure Services Co-coordinator is responsible for the delivery of recreation activities and programs designed to provide leisure experiences which are truly satisfying and rewarding for participants. The position requires working with people of all age and ability levels. Entry level career opportunities exist in both the public and private sector. Recreation and Leisure Co-coordinators find employment in: municipal recreation departments; commercial centers such as fitness clubs and health spas; non profit service agencies such as Boys and Girls Clubs and the Y; residential centers (condominiums and public housing), in- house industrial recreation centers; sport and outdoor camps; sport and recreation departments of community colleges; therapeutic recreation centers; and correctional services. Regulatory law administrators practice legal and public administration in both public and private sectors. They are equipped with substantive law background and the professional skills necessary to administer client files and regulatory compliance programs. Regulatory law administrators can also specialize in such areas as dispute resolution, and occupational health and safety. Employment opportunities can be found in government legal departments, private law offices, and corporate scenarios. A Coach's role is to teach, lead, organize and sometimes even counsel. They teach others their knowledge of sport and help athletes develop and improve their skills. They motivate and help athletes set and attain goals. In addition Coaches manage schedules, design programs, prepare equipment, establish parameters and evaluate athletes. Coaches also council, providing guidance and support. Employment opportunities for Coaches exist in community centers, private sports programs, after school activity programs, the school system, and the professional sports arena. Coaching is also a means to starting a business in recreational services. Social Service workers offer valuable support and information to diverse communities. They develop the abilities to respond to individual and community issues of homelessness, poverty, substance abuse, mental health concerns, oppression, crisis and other determinants of health and areas of social justice. Family work, group facilitation, program planning, community resource management, service delivery co-ordination and advocacy all fall under the scope of work. Employment opportunities can be found in a number of agencies including addiction and mental health services, residential group homes, day treatment programs, case management services, shelters, drop-in and community centers, family service organizations, hospitals, governmental and non-governmental services. In addition there is opportunity for international placements. Health and wellness in the corporate setting is an emerging and exciting field in the health management sector. Many large corporations are identifying that a health and happy work population is also a productive population. To that end Health and Wellness consultants emphasize a holistic approach to achieving workplace, community and personal wellness and promote a mutli-disciplinary approach to well being . They assess health risk factors, design implement and evaluate strategies and programs, manage programs and personnel in accordance with organizational policies and procedures and implement lifestyle coaching. Employment opportunities can be found in the corporate sector, not-for-profit institutions, universities, hospitals and international locations. Health Information managers work with health care providers and stakeholders to transition from the paper health record to the electronic health record. They are integral in developing, implementing and maintaining health information systems. They protect patent information and promote confidentiality awareness as well as controlling the release of medico-legal information. Health Information managers evaluate standards of documentation according to established criteria and provide essential information for clinical research, quality improvement, utilization review, budgeting and other administrative applications. Employment opportunities exist within acute care hospitals, ambulatory care facilities, Ministries of Health, insurance companies, computer companies' health record consulting firms and veterinary hospitals. Bringing together people, information and materials, health information technicians meet the challenges of a constantly changing information environment. They use the latest information technologies to organize and retrieve information. They work in environments as diverse as business corporations, hospitals, clinics, professional firms, cultural organizations, financial institutions, schools, and public libraries. A wealth of opportunity exists in the expanding information sector, including Internet applications, training, and customer support. Most people's lives are affected by the news media- newspapers, magazines, television, and radio. Journalists have a responsibility to present the news as accurately as possible, and be fair and ethical in their reporting. They research their topics and prepare and edit their work. Journalists can share their message through various mediums, each of which demands its own skill set. Career opportunities include: news anchoring, reporting, researching, writing, video shooting and editing. Other employment areas include audio visual departments, fire and police services, government, and corporate settings. Health care is a business and, like very other business, it needs good management to keep it running smoothly. Health Services managers are responsible for planning, directing, coordinating, and supervising the delivery of healthcare. They can be generalists and manage entire facilities or can be specialists and be in charge of specific clinical departments or services, such as out-patient care or patient intake. They are often called upon to improve efficiency in health care facilities and the quality of health care provided. Employment for Health Services management can be found in hospitals, nursing homes, rehabilitation clinics, private physicians' offices, outpatient centers, and community care facilities.